Flavius Placidius Valentinianus Augustus was Western Roman Emperor from 425 to 455. 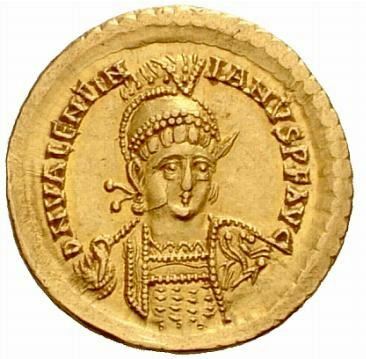 Appointed when he was only two years old, Valentinian had excellent ancestry - he was the son, grandson, great-grandson, cousin, and nephew (twice over) of Roman Emperors. This was of little help to him; his reign is marked by the dismemberment of the Western Empire. By the time of his death, virtually all of North Africa, all of western Spain, and the majority of Gaul had passed out of Roman hands. He is described as spoiled, pleasure-loving, and heavily influenced by sorcerers and astrologers. He was assassinated in 455, and succeeded by Patronius Maximus. Obverse: DN VALENTINIANVS PF AVG, Pearl diademed, draped, and cuirassed bust right.